Post-Christie, will New Jersey energy policy shift from pipelines to wind farms? 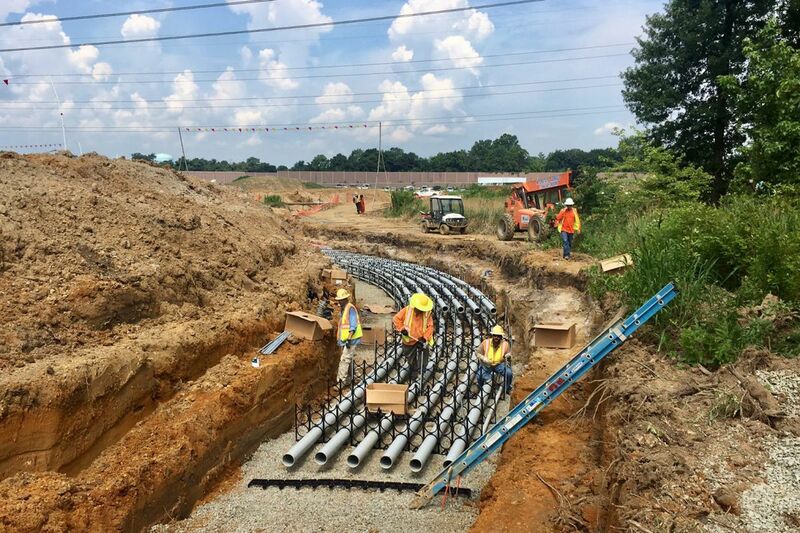 Construction related to the ‘Southern Reliability Link” pipeline in Chesterfield, Burlington County last July. If you believe climate change is real and a real threat to New Jersey — as I do — you're probably hoping — as I am — that the next governor will change Trenton's political climate around green issues. Gov. Christie's relentless push for Pinelands pipelines has been bad enough. But what seems to some like a pronounced lack of enthusiasm for the renewable energy of solar and particularly offshore wind power has arguably been worse. When not opposing offshore wind demonstration projects like the one proposed by a firm called Fishermen's Energy, the Republican governor's administration, critics say, has embraced the dubious notion that generating electricity with natural gas is an evolutionary "bridge" toward less dependency on fossil fuels. "Christie has had a love affair with the natural gas industry, They've doubled down again and again on gas, and on endorsing pipeline infrastructure projects," noted Doug O'Malley, director of the advocacy organization Environment New Jersey. "You cannot build a bridge to the future on the back of dirty fossil fuel. It's a bridge to nowhere," he added. Post-Sandy, proponents of new pipelines have vigorously waved the banners of supply "reliability" and system "resiliency." Christie's revamped Pinelands Commission this year reversed a previous decision and approved a 22-mile line through Cumberland, Atlantic, and Cape May Counties to enable the conversion of the coal-burning B.L. England power to natural gas. And in September, the commission also said yes to the 30-mile Southern Reliability Link pipeline through Burlington and Monmouth Counties. Both approvals are being challenged in court. These pipeline projects are unnecessary, over-scaled, and potentially harmful to the Pinelands, critics say. They would encumber ratepayers and utilities alike for decades to come — while simultaneously drawing resources, energy and attention away from developing alternatives to burning fossil fuels to generate power. "We're very supportive of moving to renewables. … Particularly given the federal government's reversal of [environmental] policies, it's essential that states do everything they can, if there's any chance at all of making progress," said Carleton Montgomery, executive director of the Pinelands Preservation Alliance. Greg Reinert, a spokesman for the New Jersey Board of Public Utilities, took issue with criticism of the state's approach under Christie. "The state's momentum for renewables is very strong," he said in an email response to my questions. "The State Energy Master Plan sets forth specific policies that are the foundation for change that modernizes the generation resource mix in New Jersey and promotes fuel substitution in a way that saves money, stimulates the economy, assures reliability, and protects the environment," Reinert added. New Jersey "has already met the Global Warming Response Act goal for the reduction of emissions to 1990 levels by 2020," Reinert said. Lest one assume that only environmentalists are alarmed by New Jersey's inexplicably tepid support for generating electricity from renewable sources, consider the headline, "Goodbye Chris Christie — Hello NJ Offshore Wind" in the online maritime industry publication MarineLog. The story notes that two companies propose to utilize portions of the nearly 344,000-acre New Jersey Wind Energy Area seven miles off the Atlantic City coast to generate electricity for about 1.4 million homes. But the energy producing, let alone job-creating, potential of such projects has seemed about as compelling to Christie as the incentives offered by the Regional Greenhouse Gas Initiative (RGGI, pronounced "Reggie") from which the governor withdrew the state in 2011. And the 2015 update of the Energy Master Plan Reinert referred to seems to me rather heavy on fossil fuels and relatively light ("Full of hot air," in the words of the Sierra Club's Jeff Tittel) on renewables. Meanwhile, both major party candidates for governor have indicated they're more amenable to green concerns. Republican Kim Guadagno, who serves as Christie's lieutenant governor, favors rejoining RGGI. But I couldn't find the environment listed among the "On the Issues" tabs on her campaign website — although there is a link to her declaration that New Jersey "can't afford a Massachusetts limousine liberal." By that she means her Democratic opponent, Phil Murphy, whose campaign website includes side-by-side tabs titled "Building a Green Economy" and "Building a Clean Energy Economy." There is, alas, no tab for the criticism Murphy got during the Democratic gubernatorial primary, due to his fossil fuel-rich investment portfolio. After eight years — and with a federal rollback of environmental progress just getting underway — could it be too late for New Jersey to shift its focus from pipelines to renewables? "We've lost some time and some states have moved ahead," said Tom Gilbert, campaign director of the advocacy organization ReThink Energy NJ. "But I still think we're fairly early in this energy revolution happening around the nation and around the world. "There's incredible growth in renewables. We are early in the transformation and there are huge opportunities for New Jersey to still be a leader."